Below zero temperature, snow and slippery roads did not hinder the celebratory evening dedicated to Cuba’s iconic double bassist and composer Israel López Valdes, better known as Cachao, at London’s Jazz Cafe. The event further paid homage to Cachao’s nephew Orlando “Cachaíto” López, a bassist and composer most popular for his involvement in the Buena Vista Social Club project, produced by Nick Gold and British record label World Circuit. Gold was also in the audiences attending Cachao’s Songbook event; and he congratulated the musicians for the engaging performance at the end of the evening. The father of mambo and the descarga (an improvised jamming session), Cachao performed and recorded a variety of genres, ranging from classical music to salsa. In this tradition, the event was a descarga; various musicians joined the stage throughout the evening, including tres player Alejandro Sanchez and singer and trombonist Rene Portuondo. The repertoire included a variety of rhythms, from slower classical beats to lively mambo and salsa. Beyond showcasing Cuban music, the evening also set music history straight on the heritage of the popular Latin hit “Oye Como Va”. The rhythm was originally composed by Cachao in the late 1930s. The song was written by Latin jazz and mambo musician Tito Puentes in the 1960s and later recreated by Mexican-American rock fusion musician Carlos Santana. Issues of heritage are often problematic in Cuban musical history. With the US blockade on the island and almost sixty years of international isolation, a proportion of Cuba’s international musical contributions remain unattributed. 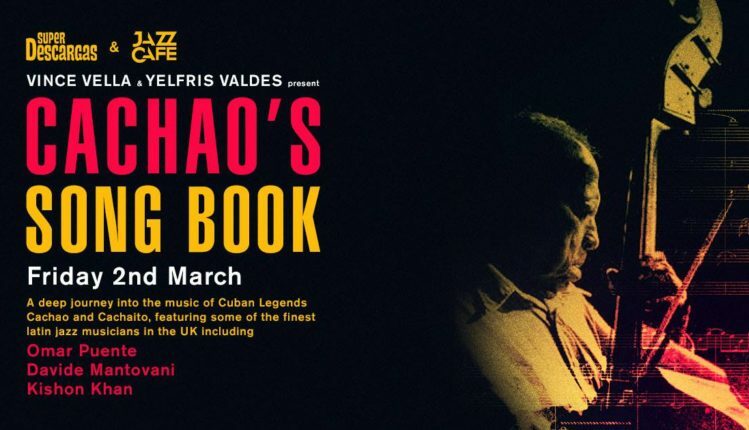 Cachao’s Song Book was a collaboration between London DJ, producer and percussions Vince Vella and Cuban trumpeter Yelfris Valdes. Vella is know for his involvement in the London Cuban music scene and for blending Afro-Cuban rhythms with electronic music. The team of musicians was versatile, including London based Cuban musicians and international players with significant history in performing Cuban music. Pianist Kishon Khan played Mississippi Mambo, a favourite by Cuba’s late iconic pianist Bebo Valdes. Khan is also responsible for two Cuban fusion initiatives in London: Lokkhi Terra (Bangladeshi-Cuban-Nigerian fusion) and Cubafrobeat (Cuban-West African fusion). The base player of the night, Davide Mantovani has been involved in a number of Cuban music ventures, including Nick Gold’s AfroCubism Revisited. The project is a collaboration between Cuban, Malian and Senegalese musicians, bridging the cultural and musical connections between Cuba and West Africa. This follows Gold’s original idea for the Buena Vista Social Club (BVSC) project, which was to bring Malian and Cuban musicians together. While Gold continues to work with BVSC veteran Eliades Ochoa for his AfroCubism performances in the US, he cooperates with London based Cuban music performers for the UK events. Besides Mantovani, these include co-host Yelfris Valdes and percussionist Hammadi Valdes, also performing at Cachao’s Song Book. Gold’s approach to collaboration with locally based Cuban musicians marks a shift in the status of London as a centre for Cuban music. Producers now feel confident in selecting locally based talent for their Cuban productions. Like current music circuits in Havana, where the same musicians play versatile genres with different bands across Cuba’s capital, these London musicians participate in multiple projects. They perform diverse rhythms, from rumba, son and salsa, to jazz, fusion and electronic music, in a variety of venues across London, collaborating with various bands and producers. Cuban music has no prejudice; and this culture translates beyond the island and beyond the stage. Cuba’s rhythms are meant for everyone regardless of any gender, social, ethnic, age or other differentiations. Cuban music is created to be enjoyed and experienced; and despite its complex structures and syncopations, it does not priorities exclusivity but participation. Everyone has to join the discharga, whether playing, singing or dancing. Audiences at Jazz Cafe kept dancing the entire evening. Beyond the musician’s various skills and nationalities, attendees were also from various ethnic and age groups. Not necessarily familiar with Cuban music or culture, Londoners enthusiastically participated in the event, dancing, clapping, snapping fingers and singing along. Few months earlier, in August 2017, I had visited another descarga organised by Vella at the same venue. Musicians included Copenhagen based Cuban conguero Eliel Lazo, London-based Afro-Cuban singer Gerardo De Armas Sarria, percussionists Hammadi Valdes and Oreste “Sambroso” Noda (also part of Cachao’s Song Book crew), ethnomusicologist and percussionist Crispin Robinson and Afro-Cuban percussion teacher Dave Pattman. The evening was saturated with traditional rumba rhythms. Versatile audiences, largely unfamiliar with Cuban music, were dancing tirelessly to rumba throughout the night, celebrating the roots of Afro-Cuban culture. Cuban music in London is sparkling the interest of eclectic audience. Yet, the contributions and work of Cuban and international musicians involved in Cuban music in the UK remain largely unrecognised by society and funding bodies. At the same time, the values of Cuban culture and society are slowly making their way into the life of Londoners. Descargas are taking root into the capital’s night life, and we are all becoming a little more Cuban without realising it.